We write this in response to the article of Olding et al. on small field dose delivery evaluation. Accuracy in planned radiation dose delivery in cancer treatments becomes necessary in the advent of complex treatment delivery options with newer technology using medical linear accelerators, which makes patient management very crucial. Treatment outcome in an individual patient therefore depends on the professional involvement of staff and execution accuracy of planned procedure. Therefore, this article has addressed an important problem. International Atomic Energy Agency (IAEA) , and International Commission on Radiological Protection (ICRP)  reported mis-administrations of radiation dose, the nature of their occurrence and complexity of situations. Lack of adequate quality assurance (QA) program or failure in their routine applications, complacency in attention, lack of knowledge, overconfidence, pressures of time, lack of resources and failures in communication are some of the general human causes of errors. A recent report  enumerated misadministration of radiation doses under the heading "harming instead of healing". Delivery of wrong doses in "small field treatment plans with stereotactic equipment" was mostly highlighted. IAEA  highlighted that the mishaps in radiotherapy involved a) incorrect manual parameter transfer; b) reversal of images in treatment planning; c) use of inappropriate measuring detector; d) erroneous calculation for soft wedge; e) incorrect Intensity Modulated Radiotherapy (IMRT) planning; and f) mis-calibration of a stereotactic unit. The New York Times  describes them as occurring due to a) lack of proper communication between electronic components; b) non-integration of retrofitted devices from different vendors; c) user error combined with safety flaws in a "mix and match" of radiation delivery system; d) X,Y jaws not confining to cone attachment, and non-identification of flaws by operators during treatment execution; e) mismatch in treatment planning system, verification system, control computers and altered information through chain of "devices"; and f) manually fed information and machine presuming it as different wrong attachment. All these resulted in an overdosing, as high as 25-100%, as per the estimates by professional experts. These reports generate a big apprehension in the minds of health administrators and regulatory bodies. Pencil beam data configuration using high spatial resolution small detectors (either diode or diamond detector) is advocated for input of beam data into treatment planning systems. , The errors involved in non-equilibrium measuring conditions, especially when large ion chambers are employed in the assessment of very small radiation fields as encountered in stereotactic treatment irradiations, are explained in these reports, highlighting the need for caution in configuring small fields for treatments. Pre-treatment verifications for documentation of safe delivery of patients' treatments and QA method for dynamic dose delivery by phantom measurements have been recommended in literature. ,, Dose validation methods using Monitor Units (MU) verification softwarein addition to film scanners or matrix detectors are found to be very useful for treatment verifications. The accuracy of ion chamber measurements vis-à-vis Monte Carlo theoretical estimations for different detectors has also been highlighted,  along with the correction required when segmental fields are measured by thimble ion chambers, for (IMRT) dose verifications. A recent review of the theory and execution of intensity modulated arc therapy (IMAT)  emphasizes the need for pre-treatment phantom measurements to validate individual patient's treatments for special plans. The article by Olding et al. does not specifically address the use of gel dosimetry for patient-specific QA. However, a previously published article by Schreiner  (one of the authors in the article by Olding et al.) suggests that gel dosimetry could have an useful supporting role in the commissioning of new advanced radiotherapy treatment techniques ("new" in the sense of being new to the clinic where the technique is being brought on-line) and in full treatment process QA (as explained by Schreiner). The article by Schreiner further suggests that the strength of gel dosimetry does not lie in the pre-treatment evaluation of dose deliveries (i.e. in day-to-day clinical practice where other dosimetric techniques have been well-established for use). Gel dosimetry needs additional infrastructure in the radiotherapy departments, and ionometric established methods have wide applications in such pre-treatment verifications to quickly make measurements in solid phantoms on preselected points. For stereotactic radiotherapy plans, we developed a pre-treatment verification method using a cylindrical tool fixable to stereotactic radio-surgery (SRS) frame. 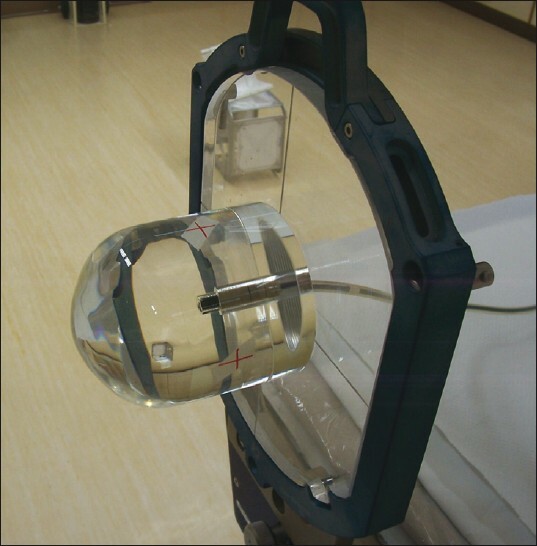 A special acrylic QA cylindrical phantom of dimensions 10 cm diameter and 14 cm length with rounded edge [Figure 1] is designed to be fixed to a 2-cm-thick acrylic plate, and mounted to BrainLab fixture to table top (Kavya Biomedicals, Bangalore, India). CC 13 chamber (volume 0.13 cm 3 ) is used as the detector for measurements. This tool, along with the fixture, is scanned with Toshiba CT scanner and the phantom dimensions are input to the iPlan TPS. Treatment plans are applied to the phantom to find out point doses at the position of detector. In our experience, this perspex cylindrical tool validated dose delivery in SRS/stereotactic radiotherapy(SRT) treatments [Table 1] within -0.4± 0.9% (n = 15), with any of the component arc field assessment of dose within very small deviations. Also, for dynamic field IMRT, the functioning of the high-energy linear accelerator measured by the ratios  of 4 mm/10 mm and 10 mm/20 mm integrated dynamic slit outputs, was within ±0.3% and ±0.03%, respectively, over the period of 3 years, validating their proper functioning. From the review of past accidents, experts conclude that  the key components for QA are a) education; b) documentation; c) verification; and d) communication. Incident reporting and developing data-base is therefore part of regulatory agency's advisory role in all the countries. ICRP  made a few recommendations to avoid catastrophic events with conventional technologies and techniques, recommending the need for independent verification of beam calibration and independent calculation of the treatment times or monitor units for external beam radiotherapy. Type approval of equipments by national regulatory authority and annual reports on safe working of machines will help as surveillance to achieve desired goals in radiation safety. In addition, dose validations and on-going quality assurance program will be one of the implemented steps to confirm averting possible mishaps. Though "regulation" will bring out "policies and guidelines" there is need to develop "attitudes in human mind" to be alert and vigilant all the time and look for establishment of methods to document pre-treatment verifications for all the individual complex procedures. MU verification software and phantom measurement protocols will be of immense help in the departments when we rely on inverse planning and digital export of information. No doubt, sometimes it may not be feasible to achieve this objective because of bulk patient loads, but it appears to be mandatory. We have to work in these directions to achieve "no accidents" era and continue with high technology developments. A simple ionometric method suggested in this work compliments to the already available methods of dose validations and makes use of a 0.13 cm 3 ion chamber, which has addressed confirmation of radiation dose delivery within 1% accuracy. Such methods could become applicable for pre-treatment verifications. The recommendation needs an optimistic approach not to be too stringent in terms of implementation to palliative, simple forward planned treatments in the interest of time constraints with the availability of accelerator time for such phantom measurements. The authors thank Head, Department of Radiation Oncology, for support from CME funds for fabrication of the QA tool, and Director General, Royal Hospital, for giving kind permission to publish the work. 1. Olding T, Holmes O, Dejean P, McAuley KB, Nkongchu K, Santyr G, Schreiner LJ Small field dose delivery evaluations using cone beam optical computed tomography-based polymer gel dosimetry. J Med Phys 2011;36;3-14. 2. International Atomic Energy Agency "Lessons learnt from Accidental Exposures in Radiotherapy". (Vienna-IAEA): IAEA SRS-17; 2000. 3. IAEA Training Course Module 2.10 Accident update-some newer events (UK, USA, France);2004-2007. 6. Das IJ, Ding GX, Ahnesjo A. Small fields-Non Equilibrium. Med Phys 2008;35;206-15. 7. Alfonso R, Andreo P, Capote R, Huq MS, Kilby W, Kjäll P,et al. A new formalism for reference dosimetry of small and nonstandard fields. Med Phys 2008; 35;5179-86. 8. Ma CM, Jiang SB, Pawlicki T, Chen Y, Li JS, Deng J, et al.A quality assurance phantom for IMRT dose verification. Phys Med Biol 2003;48; 561-72. 9. Hancock SS. South East Missouri Hospital. Report on test on steps involving SRS treatment process with commercial Luci Phantom. 2008. 10. Ravichandran R, Binukumar JP, Sivakumar SS, Krishnamurthy K, Davis CA, A method for estimation of accuracy of dose delivery with dynamic slit windows in medical linear accelerators. J Med Phys 2008; 33;127-9. 11. Sánchez-Dobaldo F, Hartman GH, Pena J, Capote R, Paiusco M, Rhein B et al. Uncertainty estimation in Intensity Modulated Radiotherapy absolute dosimetry verification. Int J Radiat Oncol Biol Phys 2007; 68;301-10. 12. Yu CX, Tang G Intensity modulated arc therapy: Principles, technologies and clinical implementation. Phys Med Biol 2011;56:R31-54. 13. Schreiner LJ. Where does gel dosimetry fit in the clinic? J Phys Conf Ser 2009;164:012001. 14. International Atomic Energy Agency Technical Report Series No.430. Commissioning and Quality Assurance of computerized planning systems for radiation treatment of cancer. Vienna: IAEA: 2004. 15. ICRP.Preventing Accidental Exposures from New External Beam Radiation Therapy Technologies.112. Ann. ICRP 39 (4). ICRP Publication: 2009. Al Amri, I., Ravichandran, R., Sivakumar, S.S., Binukumar, J.P., Davis, C.A., Al Rahbi, Z., Al Shukeili, K., Al Kindi, F.